Recurring each month, 1 Million Cups (1MC) invites two entrepreneurs to share their ideas and businesses to receive feedback from the community. Each presenter has 6-7 minutes to pitch, followed by a 15-20 Q&A session. This month, Lavanya Rajesh Kumar presented her startup business idea called AlzWel. The app provides customized, real-time help to people dealing with everyday stress, depression, and anxiety. Lavanya is a PhD student at Michigan Tech performing research in the Aging, Cognition & Action Lab. For the second presentation, David Jones and Heather Britz shared their new business called Galactic Peasants. They focus on making a variety artisan breads with locally sourced, organic ingredients. Currently, they’re selling their product at both the Houghton and Calumet Farmer’s Market. Follow them on instagram for business updates and beautiful photos of their crusty bread! Next 1MC Event at the Keweenaw Mountain Lodge! The next 1MC event will be held on October 10th, 9am at the Keweenaw Mountain Lodge in Copper Harbor. Stay posted for more information! 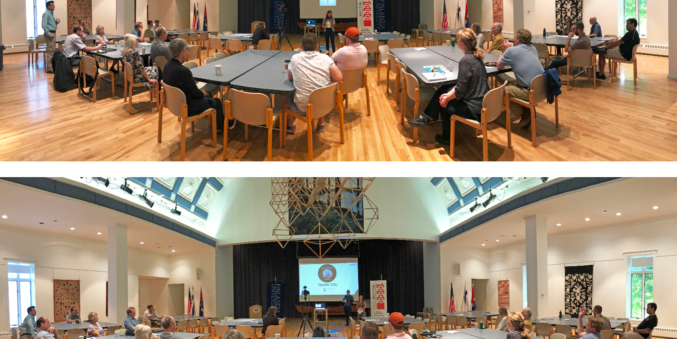 The 1 Million Cups Copper Country events are organized and hosted by representatives from MTEC SmartZone, Finlandia University, Michigan Technological University, and KEDA.